You are currently browsing the category archive for the ‘Canberra’ category. I had a glance at the post I wrote last year about my first visit to Canberra. It starts by revealing the basic elements of my one good joke, then fails to offer up the punch line. The joke is dated now, but it still appealing to anyone who loves the peculiar way Bush had with the English language. Bush scheduled a power breakfast with Karl Rove, his confidant and advisor. When the White House aide came in to take his order, George couldn’t make up his mind. Finally, he told her he wanted a ‘quickie.’ The pretty young woman turned scarlet and told the President that she might have expected to hear that sort of talk from Clinton, but not Mr. Bush. Rove leaned over and said: That egg dish you want, George. It’s pronounced keesh. It was a conference that took us back to this country’s capital. While my wife was doing her duty with her colleagues, I played tourist and did a good job of it. I had learned from our previous (ill-considered) decision to drive that it was a long way from Melbourne to Canberra. This time we booked flights. Since there was no designated hotel for the conference, I decided to book one near the city center. On the map, it looked like no more than a twenty-minute walk to the conference facility. That was mistake. Canberra is really, really spread out. A brief recap here for those who may not have read my previous post about the place. Canberra is a purpose-built city, like Brasilia. When the States federated, neither Sydney nor Melbourne was willing to cede the seat of government to the other city, so they decided to build a capital from scratch. A search committee considered several potential sites, (all of which had to be at least one hundred miles from Sydney), and a competition was held to elicit designs for a city plan from architects around the world. Out of 137 entries, an architect from Chicago by the name of Walter Griffin won the field. It would change his life forever. He had worked for five years with Frank Lloyd Wright, but after the headline broke, Wright never spoke to him again. Griffin and his wife would end up moving to Australia. Although the city’s plan had been chosen in 1912, it would take more than half a century for the most attractive and ambitious part of the layout to be constructed — a large expanse of ornamental water, a lake. The site had been selected partly because of its steady source of water, the Molonglo River. Coming from almost anywhere in the parched country of Australia, Lake Burley Griffin looks lavish, almost looks like a mirage, simply too large and too blue to actually exist. During our brief visit, I was able to tour the Old Parliament House, the High Court, the National Gallery of Australia and the spectacular new Parliament House. The Old Parliament House, home to my wife’s conference, is a substantial and pleasing white Colonial structure that would not look out of place in India. It was built as a temporary parliament, not intended to serve for more than fifty years. It is currently being turned into a Museum of Democracy. I’m glad we got to see the building as Australia’s previous Parliament building, not an interactive museum. The new Parliament is almost brand new. It was finished only eleven years ago. Its design was the result of yet another competition, won by an Italian architect, Romaldo Giurgola, based in New York City. It is a billion dollar building buried into the side of a hill. Unassuming from the outside, its interior is grand and impressive. In addition to the senate and house chambers and a grand hall, there are an additional 4,700 rooms. Its roof is covered with grass, the greenest I have seen outside of a golf course. Over this towers a stainless steel flag pole that can probably be seen from outer space. From the roof, you can see Griffin’s vision– the long sweep of the boulevards, the grand design of the lake, the concentric circles, the placement of the government buildings. The scope and scale are impressive, but even with 340,000 people the place seems empty. Everyone lives in the suburbs. The city offers some wonderful cycling, but it is not pedestrian friendly, and hardly anyone appears to live downtown or even in the government quarter. On weekends, the capital is deserted by everyone but tourists. With the exception of South Capitol, it is much the same in Washington DC. It’s the capital syndrome, I guess, and it’s a shame. Beautiful cities, but no people in them. There is a joke making the rounds about our beloved president at a power breakfast. With his inimitable ability to mangle language, he shocks the White House kitchen staff with his mispronunciation of the word “quiche.” It is merely French, after all. My use of the word has nothing to do with either Bush or the previous occupant of the White House. It refers to the duration of our recent stay in Canberra in comparison to the actual amount of time it took to get there. The point of the jaunt was an academic conference. When I suggested driving, I didn’t really consider the ramifications of my offer. For me, it was an excuse to see a bit of the nation’s capital and do a bit of cycling on my own bike. Canberra is a very cycle friendly city. It is, however, some 400 miles from Melbourne. The Hume highway is four lanes wide with the exception of a long stretch of construction just before you reach Canberra. What I hoped would be an eight hour drive stretched into nine. The scenery varies little. We had covered the first half on our way to cycle the Murray to the Mountains rail trail. The second half wasn’t much different. When Australia’s separate colonies were federated in 1901, neither Sydney nor Melbourne could concede the national capital to the other, so an Australian Capital Territory was established. The creation of Canberra was the compromise. In 1908 a site was selected and a competition was held to lay out the city. Astoundingly, Walter Burley Griffin, an American architect, beat 136 other entries to design the capital of Australia. He was from Chicago, but his main influence was definitely Washington D.C. Even though the automobile age was in its infancy, it seems like the city was designed for cars. Canberra is dominated by wide boulevards and sweeping vistas, dotted with low, grand, government buildings. A river was dammed to create a large lake in the center of the city. The one exception to the tasteful, sedate pattern of architecture is the National Museum of Australia. Designed by the firm that created Federation Square in Melbourne, it is outrageous in both color and design. I couldn’t stop taking pictures. Canberra is now a city of some 305,000 Australians. Like many capital cities, it seems to arouse the ire and contempt of the natives. 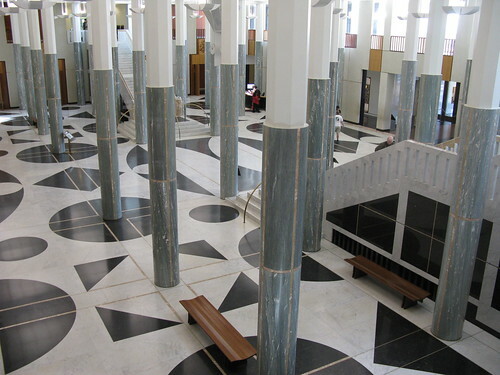 The new parliament house (which took eight years to build and topped out at over a billion dollars) was the winner of yet another design competition. It is built into a hillside and covered by grass. Our home base was a grand, gracious 5 star Hyatt once known as The Hotel Canberra. 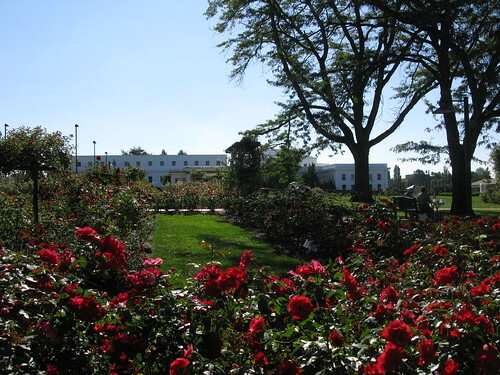 It was established in 1924 as a Government-owned hostel. Three years later it became the Hotel Canberra. For many years it was the only hotel in the A.C.T., and even after the opening of other hotels in the city, it remained the home of many politicians. I’m afraid your faithful correspondent down under was a less than efficient tourist on this visit. From our arrival on Friday evening until our departure on Sunday around 11 am, I saw only the hotel, the Museum of Australia, and about half of Lake Burley Griffin from the bike path. Twice. As is usually the case with hasty encounters, the visit was less than satisfying. I’m looking forward to a return bout with the capital, its museums and the surrounding countryside. I think I’ll fly next time. Or cycle. Stay tuned.